TracFone is the top prepaid wireless service provider in country. With no contracts, unlimited minutes and data carryover, and the ability to use your own smartphone with the plan, TracFone offers a level of flexibility and customization to over 23 million subscribers that other carriers can’t. And although TracFone uses coverage networks from some of the top providers like AT&T, T-Mobile, Sprint, and Verizon, some users might find themselves having a hard time taking full advantage of top 3G, 4G, and 4G LTE speeds. If this sounds a little too familiar, the problem may not actually be your phone or your network. Instead, the solution may lie in strengthening your cell signal. If your TracFone usage is plagued with spotty coverage, unimpressive reception, or you just can’t seem to get your cell phone to connect to the faster 3G, 4G, and 4G LTE networks, you might have a weak signal. For most people, diagnosing a weak signal comes down to three main things: distance from a transmitter, outside interference, and building material. And unfortunately for anyone who uses a cell phone, the list of objects that end up causing interference is practically endless. For those of us in urban areas, the typically dense materials used to construct buildings such as rebar, concrete, and metal are pretty common deflectors of cellular signals. What’s more, if the tunnels and subways that you use every day aren’t outfitted with signal amplifiers then a good portion of your day might be spent with an especially weak signal. People outside city limits aren’t safe from signal interference either as natural phenomena can be just as troublesome. Landscapes that feature mountains and forests have been known to warp signals as well as weather patterns like clouds and precipitation. Even simple changes in temperature can throw off your reception. It’s clear, then, that in addition to distance from a transmission tower, interference is also to blame for low bars, dropped calls, and poor reception. If Distance + Interference = Poor Reception and you can’t do anything to change either of these factors, what options do you have? The answer is simple: use a TracFone Signal Booster. The TracFone signal boosters work like this: they take in the transmitter signal, improve its strength, and then deliver it to your phone. So, instead of being left with the damaged signal from a tower, your cell phone now has access to a signal up to 32X stronger than before! Plus, these boosters can work from home or on the move in a car or boat. To some of you, this might sound like a device known as a MicroCell or Femtocell. These devices will typically come with a host of additional fees and also need to be constantly connected to the internet using a landline. Sounds like a hassle, right? Fortunately, these are not femtocells! The TracFone cell phone signal boosters mentioned here take the signal you are already getting and amplify it up to 32X so you can get better coverage. No landline connection and no monthly fees required. So, if you’re looking to improve your signal without having to negotiate with a carrier, a signal booster is for you. The market for FCC-certified signal boosters is fraught with mediocre products sold by reputable brands. Some of them may follow through with their claims, while others tend to fall short. And when it comes to figuring out which is which, customers generally go with a company that has crafted quality products year after year; they go with a company they can trust. That’s why weBoost by Wilson Electronics, with high-quality signal boosters backed up by a money-back guarantee, has proven to be an industry leader for years. Whether you are using your signal for gaming, business, surfing the internet, or for emergencies only, weBoost TracFone signal boosters will give you the power you need in any situation, and then some. What’s more, weBoost signal boosters from Wilson Electronics are carrier-proof. That means if you switch over to plans on Verizon, AT&T, Sprint, or T-Mobile, these boosters will work just as well as with your TracFone. Worried if your phone is compatible? No need! weBoost signal boosters provide the same signal boosting power across the board so any phone (iPhone, Android, Samsung, LG, Blackberry, etc.) will all receive the same amplified signal. Commercial buildings up to an impressive 100,000 sq ft.
A tried-and-true Tracfone signal booster for home use, the weBoost Home 4G is a solid choice for single offices, home offices (SOHO), and various other smaller units like cabins and apartments. While the weBoost Home 4G may improve 1-2 room coverage at its peak performance, we have had reports that buyers needed to be nearer to the antenna than they anticipated. This TracFone amplifier surely is a fan favorite. It offers coverage of up to 5,000 sq ft under the best conditions and depending on the strength of your outside signal at the time. A fair amount of customers have reported that it averages out at 2,500-3000 sq ft however. In any case, this amplifier is by far one of the top options on the TracFone signal booster market for most size homes and small offices as well as farm houses and other buildings under 5,000 sq ft. If you’ve experienced spotty reception, frequently dropped calls, and a generally weak cell phone signal then here’s your solution. If you’re looking for the most powerful home TracFone signal booster you can get, then look no further. 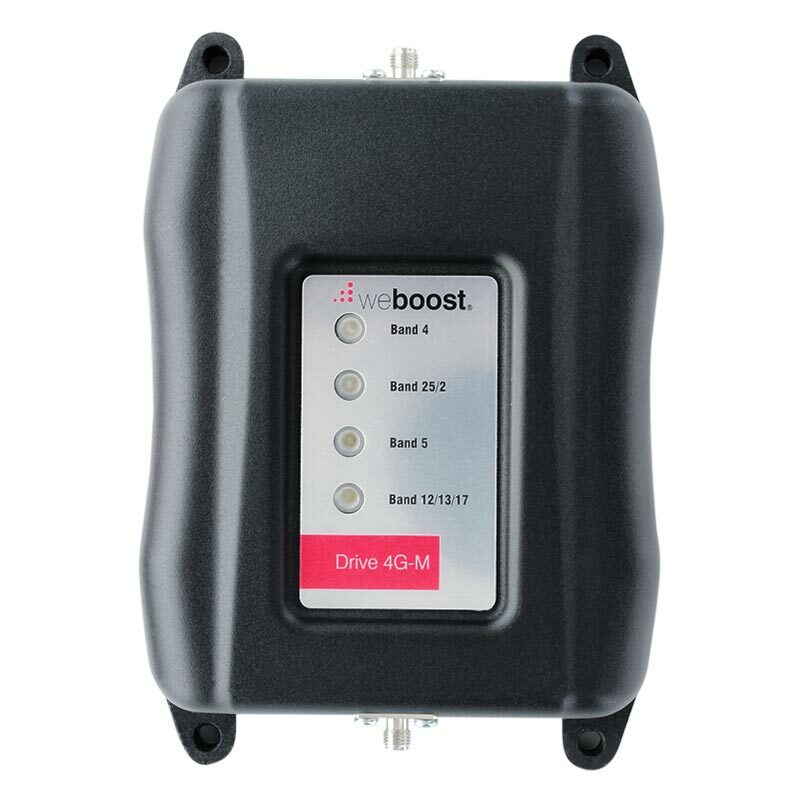 The weBoost Connect 4G-X’s maximum range is a whopping 7,500 sq ft with an general range of 5,500 sq ft for particularly weak signals. If your cell phone signal is especially weak due to living or working in a remote area or a multistory building, this booster will help you get the coverage you need. Travelers on a budget will find this amplifier both effective and affordable. Get the best results by pairing it with your Bluetooth headset. It can be placed right onto your dashboard and users looking to get the most out of their signal amplification should insert their smartphones into the cradle. Wider smartphones may be a tight fit. The Drive 4G-M features minimalist designs for both the inside and outside antennas as well as an average 2 to 3 bar signal strength gain for most customers. Although some customers felt they had to be closer to the antenna than they anticipated, the quality of this amplifier helps to make our most popular car signal booster by far. From 4G-M to 4G-X, the difference between this model and the last extends beyond just a single letter; it’s far more powerful as well. Don’t let the +50db fool you. In fact, the 4G-X actually has 2x uplink power which roughly translates to 30 to 60% farther reach to the cell tower than your average car booster. Less dropped calls, better quality and reception, and further reach in even the remotest of areas makes the 4G-X the best choice for those looking for maximum coverage. There are many cellular solutions for buildings with a range from 25K to 100K sq ft. This model happens to be the sweet spot with coverage up to 50,000 sq ft. Many of our professional installers and their enterprise customers have been happy with full bars and better reception throughout the building. But it's best to talk to a customer install & support team to get the best results. No hassle, free consultation with our dedicated support team based in the USA (sales@wilsonamplifiers.com). Each and every one of our products comes with a 2-year warranty along with lifetime technical support provided by our unparalleled US-based customer support team. We know that every situation is different. That’s why we operate on the “listen first: speak second” principle. Our motto is, after all, to “Provide Solutions. Don’t sell boxes” and we’re here to help you get the best signal possible. Have a look at these reviews from some of our real-life clients. With over 30,000 satisfied customers and years of in-field expertise, it’s no wonder that Wilson Amplifiers has landed on the top 100 companies in Texas (#1 in Houston!) and the Inc 5000 Fastest Growing Companies List for the second year in a row.